Dr. Deepak Kalia, MBBS, MS (General Surgery), M.Ch (Burns & Plastic surgery), is director of Dr. Kalia’s Cosmetic Surgery Clinic. The Clinic is known worldwide for best hair transplant in India, having scientific technologies like FUE (Follicular Unit Extraction) and maintaining International standards at an Indian price. Dr. Kalia’s Cosmetic Surgery Clinic has established itself as one of the leading FUE ONLY hair transplant & restoration clinic in India and is the first clinic to have most advanced method of liposuction in North India. Dr. Kalia, did his M.Ch. in Cosmetic & Plastic surgery from Postgraduate Institute of Medical Education & Research (PGIMER), Chandigarh, the most prestigious institute for Plastic Surgery & training in India. Subsequently served as a senior resident there for six months in the Department of Pediatric Surgery and another two & half years in the Department of Plastic Surgery. Also during his M.S., he was resident at Government Medical College, Patiala and worked in the department of General surgery as well as Super-specialities such as Cardiothoracic surgery, Uro-surgery, Plastic surgery, Emergency & ICU care. *Treating burns, including salvage of major burns with recent modalities of early excision & coverage, I.C.U. management with the use of modern drugs & techniques, microvascular surgery and Replantation of amputated parts. He has presented his work named "Series of 1024 cases of hair transplant" at National Conference in 2014. His articles & interviews are published in media time to time and he actively participates in various conferences to update his skills with new technologies & methodologies of Plastic Surgery and Hair Transplant. ***High Quality of hair transplant, very nice surgeon and delightful staff. Must recommend to people who are looking for transplantation surgery around Chandigarh! 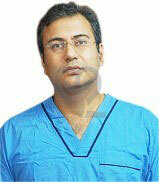 ***Few months ago I got FUE- Hair transplant by Dr. Deepak Kalia.I am so satisfied by his work. He did it so perfectly that nobody could ever make out that once I was bald. My hair look so natural. I strongly recommend that if anybody wanna have hair transplant do meet dis doc. ***I was suffering from hair loss from last few years and about 35% of my scalp was bald. After searching over internet I met Dr. Deepak who suggested me to go for hair transplant. Im fully satisfied with the results.. Thanks!